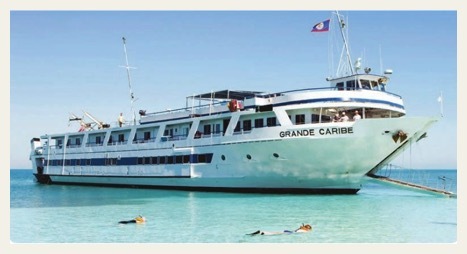 Sail away to Caribbean paradise on the Grande Mariner cruise ship (only 44 cabins). This Caribbean cruise voyage carries you from the remote islands of the Belize Barrier Reef (the world's second longest barrier reef). 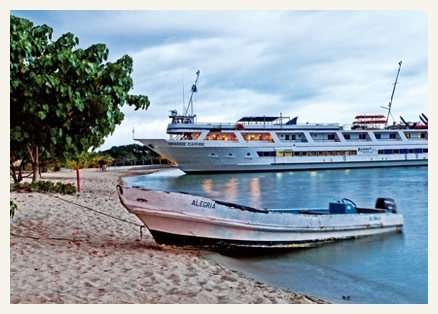 White sands, swaying palm trees, Mayan ruins, and rainbow-colored reefs are yours to explore on this unique Central America small ship cruise! 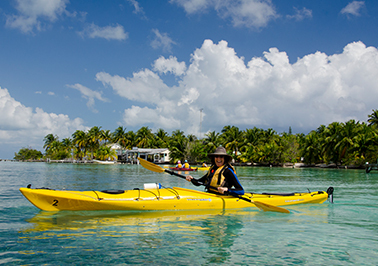 Relax and admire the stunning scenery and explore in Belize and Roatan! Transfers between Goldson Airport in Belize City or Galvez International Airport in Roatan to and from the vessel are included. Transfers are not included for passengers arriving early. Optional sighting tours are at an additional cost. All itineraries including ports, activities and routes are subject to change based on availability, weather, river, water levels and sea conditions. There’s nowhere quite like it in the world. 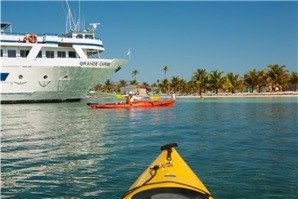 This tropical adventure carries passengers through the untouched, clear-blue waters of paradise for twelve days of kayaking, snorkeling, and island exploration. 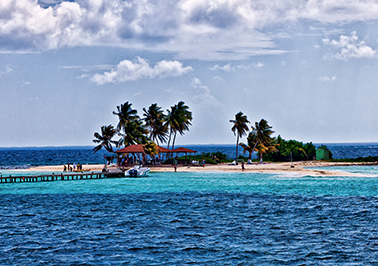 Belize is an eco-lover's dream where flora, fauna and cultural heritage are the primary attractions. Swim and snorkel in the pristine tropical waters at several of the 200 cays which lie just off the mainland. 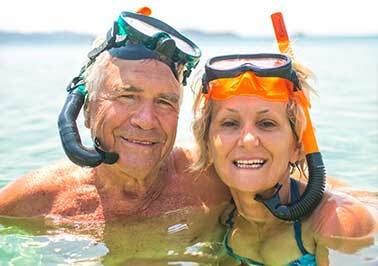 This country is world-renown by serious snorkeling enthusiasts as an exceptional must-experience destination. The extensive barrier reef system teems with colorful and varied marine life including blue striped grunts, damsel fish, and sergeant majors. 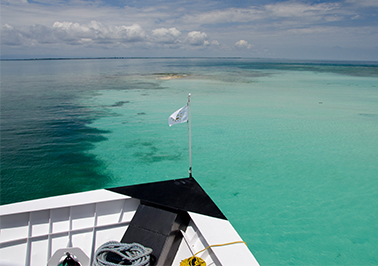 Naturalists onboard will enhance your knowledge of the area’s fragile ecosystems, wildlife, archaeology and ancient civilizations. 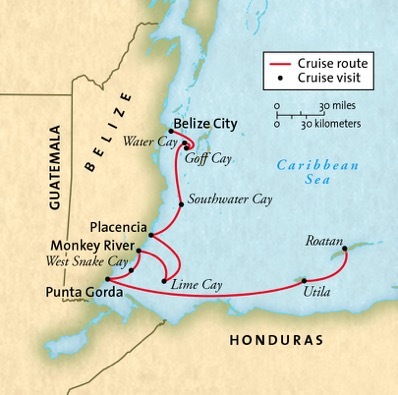 This itinerary features stops at Roatan and Utila located in the Bay Islands chain off the north coast of Honduras. These islands exude authentic Caribbean charm and have diverse topography from white sand beaches to jungle-covered hills. Meet native people who have maintained their identity and traditions despite the intrusion of the modern world. 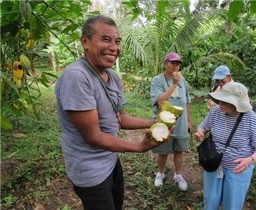 Optional tours from Belize City include excursions to a Mayan ruins site, the celebrated Belize Zoo, and more. Explore this world with onboard naturalist and you’ll find this unspoiled, natural destination as impressive as we do. Commissioned and built by Blount Boats of Rhode Island in 1998, the Grande Mariner makes her way from Montreal to the Caribbean in the spring. 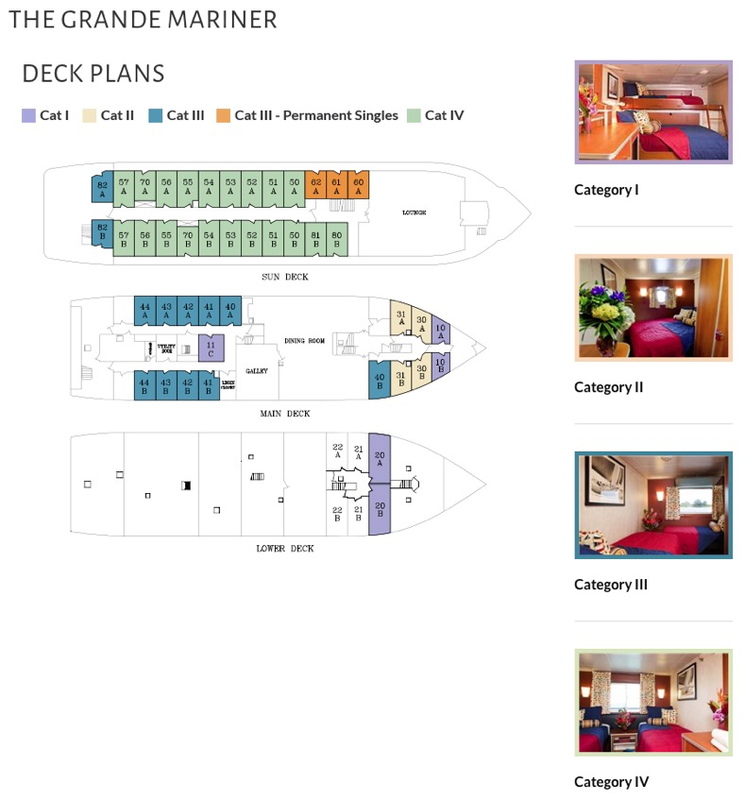 She was refurbished in 2010, with totally new cabin configurations including new décor, new bathrooms, new furniture in the cabins, a renovated lounge, new décor, and brand new furniture. So if you want to take in a few rays on the sun deck, relax and enjoy the vista-view lounge, or just have a few quiet moments in your cabin as the sea drifts past your open picture window, the Grande Mariner is ready. 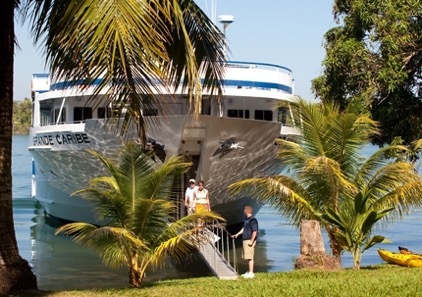 The ship is innovative, with a unique bow ramp for easy access to beaches and for swimming, a shallow draft allowing for explorations where larger ships cannot go, and even glass-bottom excursion boats. 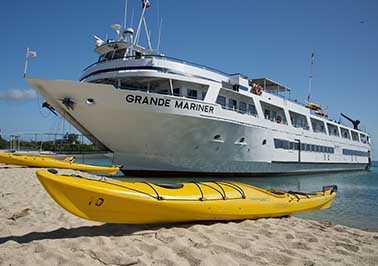 The Grand Mariner has the freedom to go where the big ships cannot. The freedom to steam down rivers, as carved wooden canoes drift alongside. The freedom to enter small harbors, tie up on a local dock, and head inland to explore. 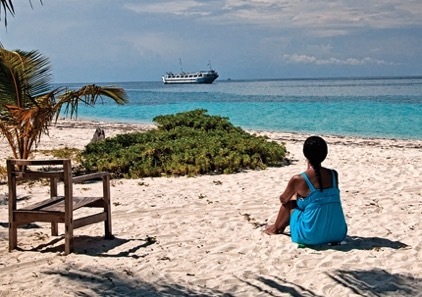 The freedom to find a small island, land on the beach and do some sunbathing, miles away from the crowds of tourists. All this freedom comes down to size. The big ships are really, really big, which puts big limits on where they can go. And when it comes time to dock, they only have a few places they can fit. 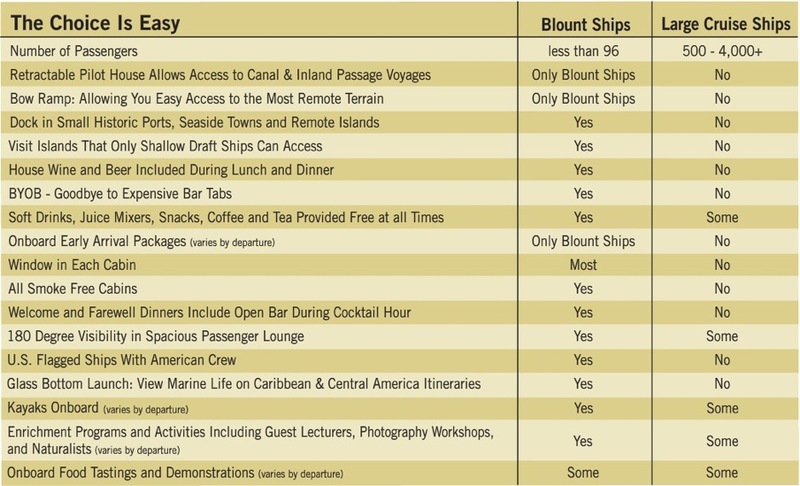 That's why the big cruise lines all go to the same places, and their passengers all end up exploring the same ports. With small ships, the map of destinations opens up. Suddenly, real exploration is possible. On every corner of the map. Exploration that takes you to countless less-travelled ports, rivers, and small islands. Places unchanged by constant tourism. It's the difference between going to a place, and being in a place. And it makes all the difference in the world. Everything's different on small ship adventure. These are CASUAL CRUISES, without the hustle, bustle, and chaos of the big ships. You’re joined by fewer than a hundred people. And more often than not, they’re people just like you. Curious. Casual. Adventurous. They’re looking for something more personal than the big ships can offer. Something more than deck after deck of strangers. Every part of your cruise is simply more personal. You’ll dine in a single sitting with an open seating plan, giving you the freedom to meet your fellow travelers. Want to go exploring in your own way? Just grab some snorkeling equipment, or sign up for kayaking or biking. There’s no white glove dining service, no formal attire, and no luxurious cabins. But there is a 180-degree vista-view lounge —the ideal place to get to know your fellow passengers as glorious, scenic landscapes unfold before you. Go upstairs, and you’ll find the upper deck, the perfect place to catch a breathtaking view, or catch a few rays. When it comes time for a good night’s sleep, our ships offer four categories of small ship cruising cabins. 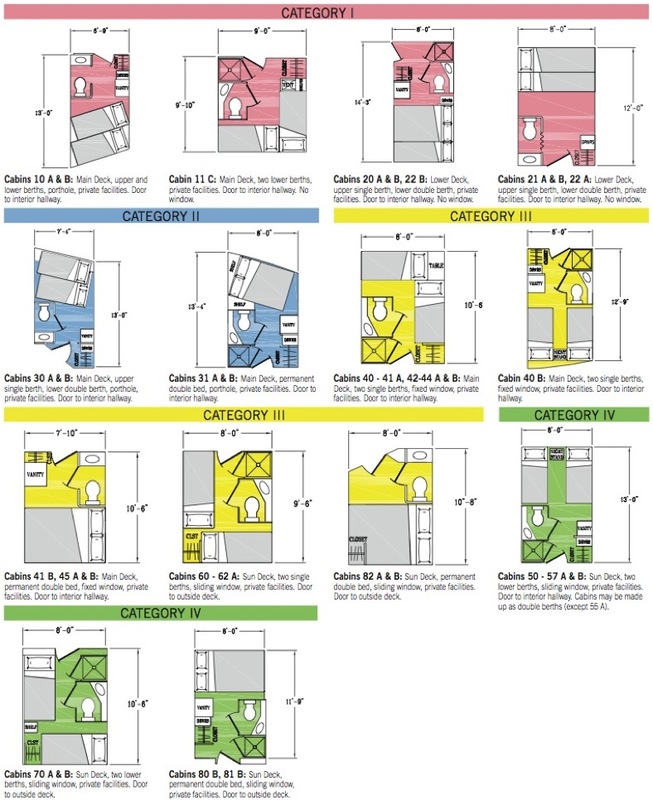 Each feature individual air conditioning, which continuously brings fresh air into your room, day and night. Your room also features a private shower and bathrooms, and a fresh, smoke-free environment. Your accommodations onboard, delicious meals (including complimentary house wine and beer with lunch and dinner), and all onboard entertainment is included. 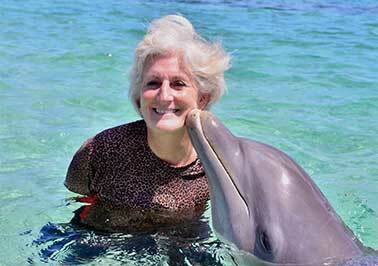 What’s more, the cruises have a historian or naturalist traveling with you, ready to provide information about the sights, people, and wildlife you’re seeing. 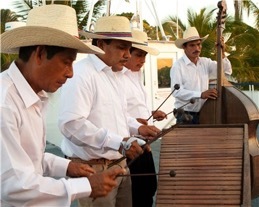 Your fare also covers things like our glass bottom boat tours, snorkeling excursions, and performances by local musicians, storytellers, and area experts. And you’re invited to “bring your own bottle.” So if you have a favorite bottle of bubbly, a great wine from home, or a certain kind of cocktail you love to sip at sunset, bring it along, and we'll keep it chilled in the lounge. We’ll provide the mixers, barware, and bottle storage, free. The best part is, because you're bringing your own drinks, you won't have to worry about ringing up a big bar tab at the end of your trip - and that's certainly worth a toast. Get up-close to the people, places and marine life of this unique area learning about the local ecosystems, traditions and history. This bustling city is home to a diverse group of inhabitants from a sorted history of settlements. Now, Belize City is the heart of Belize. Ideally located on the edge of the barrier reef, Goff Cay supports thriving populations of lobster, conch and enormous sea turtles. Beautiful beaches and the sparkling Caribbean Sea make for a picture-perfect tropical destination, seen only on post cards. 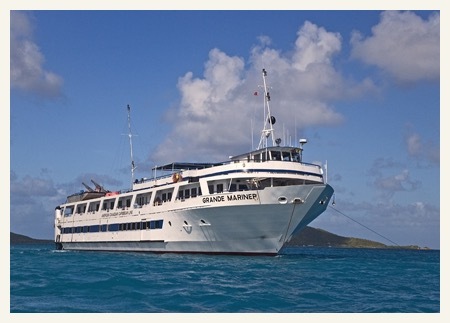 Anchor in the calm waters at Water Cay and admire the stunning seascape views on the ship’s main deck. Water Cay is located adjacent to the deep water channel, approximately twenty minutes from the mainland and minutes from the world’s second largest barrier reef by boat. 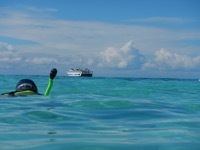 Crystal clear waters are ideal for fishing, swimming, snorkeling and deep sea diving. Patch reefs, white sand and extensive seagrass meadows surround this idyllic island. 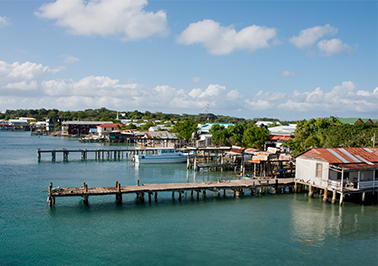 Be greeted by the beautiful fisherman's dock, filled with yachts and local fishing ships. Watch for falling coconuts from high trees as you step onto the island. Explore the waters or the islands’ mangrove habitats at this stop. Replete with palm-lined beaches, this 16-mile peninsula has become known as an eco-destination. Step off the bow ramp of the ship and onto the sandy shore to visit this village. 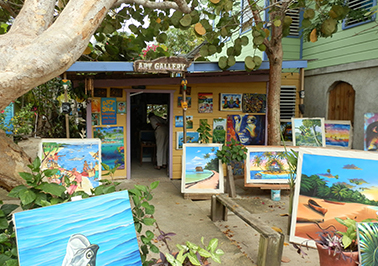 Once a fisherman's town, now offers a variety of shops, restaurants, wildlife-watching and galleries, which are all available to visit while the ship is docked here. Part of the Sapodillas Cayes Marine Reserve, Lime Cay is among the southern most group of islands in the Belize Barrier Reef which is the second longest barrier reef in the entire world. 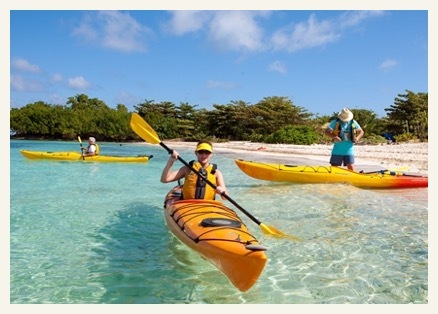 Swim, snorkel or kayak on the spectacularly clear waters. Treat yourself to a nap on these unspoiled beaches, but be sure to not miss the activities on the island! Hermit crab races, local cuisine and lively entertainment await! 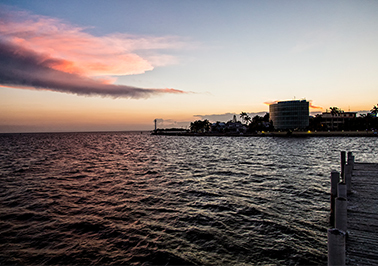 This southernmost city is a seaport and fishing town that is also home to a unique mix of Garifuna, Creole and Mayan cultures. These communities combine on shop days, when the entire neighborhood triples when vendors come to sell their respective goods. 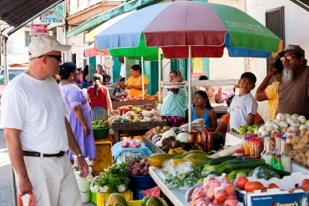 Explore the village market and browse an array of family-owned shops. 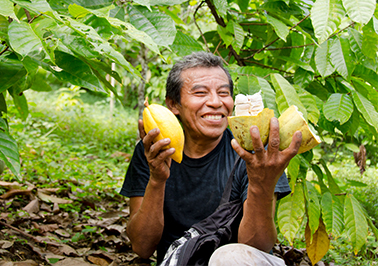 On an optional tour, indulge in the decadence of traditional Mayan chocolate as you visit a local cacao farm and learn how cacao farming supports the community. 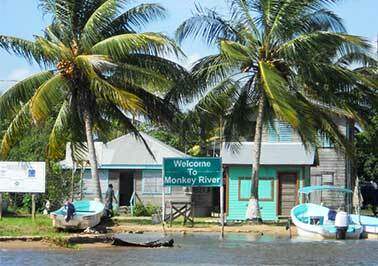 West Snake Caye is one of the district’s and even maybe one of Belize’s best kept secrets. Coral white sand and aqua blue waters combine with patch reefs and colorful fish to create a lush destination not to be missed. This is a quintessential swimming and snorkeling location for passengers to explore Central America's waters at their very best. The Monkey River maintains importance for a number of ecological and practical reasons. This body of water connects the Mayan Mountains to the coastal waters known as the Gulf of Honduras. Here the region boasts one of the most diverse ecosystems in the world. 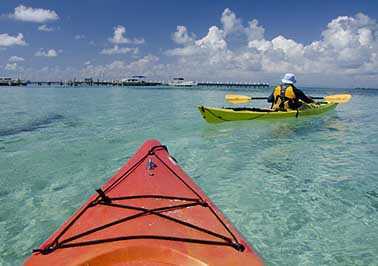 Wildlife is abundant; channels wind through coastal mangroves and offer great possibilities of manatee sightings. Look up and you may even catch sight of a Howler monkey, for whom the river was named. Enjoy the gentle pace of this island paradise. 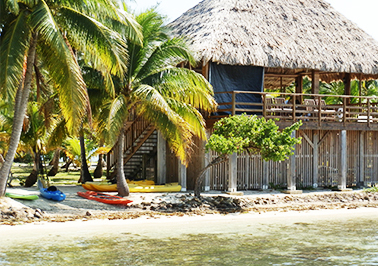 Utila is a snorkeler’s retreat with a reputation for being the best diving destination in Central America. The island offers more than eighty diving sites among its widespread reefs abounding with marine life. Experience the best of Central American cuisine, locals and loyal visitors will recommend, "tacos if you’re busy the next day or quesadillas if you have the morning off to recover." 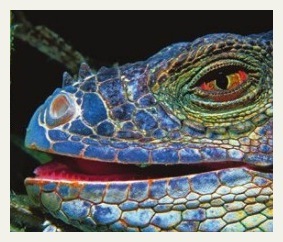 Between eating and swimming, you may opt to visit the local Iguana Farm, where there are plenty of reptiles and even more photo opportunities! The largest of the Honduran Bay Islands, Roatan is a favorite spot for scuba diving and snorkeling. Admire the natural beauty of this island from Fantasy Island Resort, where we will be spending one night. Here, you will have your choice of a range of activities. 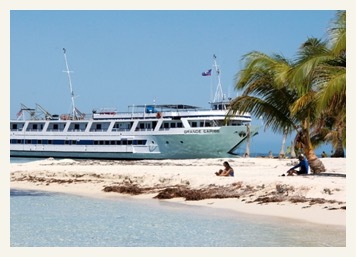 Swim with dolphins, dive into the second largest reef in the world, or simply relax on the beach. Contact us to receive a reservation form. 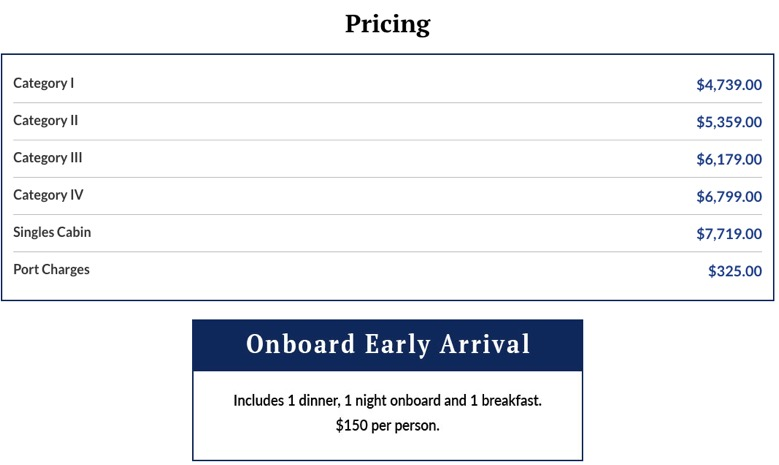 A deposit of $600 per person is due to confirm your reservation is made. Payments can be made by check or credit card (MasterCard, VISA or Discover). Final payment of balance is due 60 days prior to date of sailing. All reservations are subject to a minimum $250 per person cancellation charge. Passengers may cancel subject to the charges listed below. Cancellations must be confirmed in writing by the passenger or travel agent prior to departure to be considered valid. This cancellation policy applies to booking made on or after 5/1/2018. 29 days or less = 100% of fare. There shall be no right to any refund except as stated, and no obligation or liability to passengers for cancellation and/or non-use of all or a portion of a voyage or other services, whether or not due to circumstances beyond passengers’ control. We strongly encourage all passengers to purchase trip insurance. Once purchased, trip insurance is non-refundable. Travel insurance policies included "cancel for any reason" are available and information will be provided. You are welcome to call us anytime at 1-239-992-9660, or toll free at 800-446-9660, or email us at travel@GoExploring.com for more information.